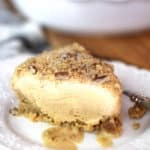 My Pumpkin Ice Cream Pie is an amazing fall dessert, combining ice cream with pumpkin, brown sugar, and fall spices – over a graham cracker crust. Make it ahead of time for less stress during the holidays. This dessert is Mike’s mom’s recipe. She always made it for the holidays and it makes me think of her and how she absolutely loved spending time with her family. She was a one-of-a-kind lady, and we miss her so much. I’ve made this recipe a hundred times (or so), in different forms. You can make it in a pie plate, a cake pan, or any size you like – depending on the group you are serving. Just adjust the serving size directly in the recipe itself. The ingredients will adjust accordingly. There are three parts to Pumpkin Ice cream Pie. Use a food processor to grind the crackers into crumbs. Mix it with sugar and butter and press into a pie plate (reserving some for topping). Soften the vanilla ice cream. Add the pumpkin, brown sugar, and spices. Mix well and pour over the cooled crust. Add some reserved graham cracker mixture to the top. Chop up a few pecans and add them as well. 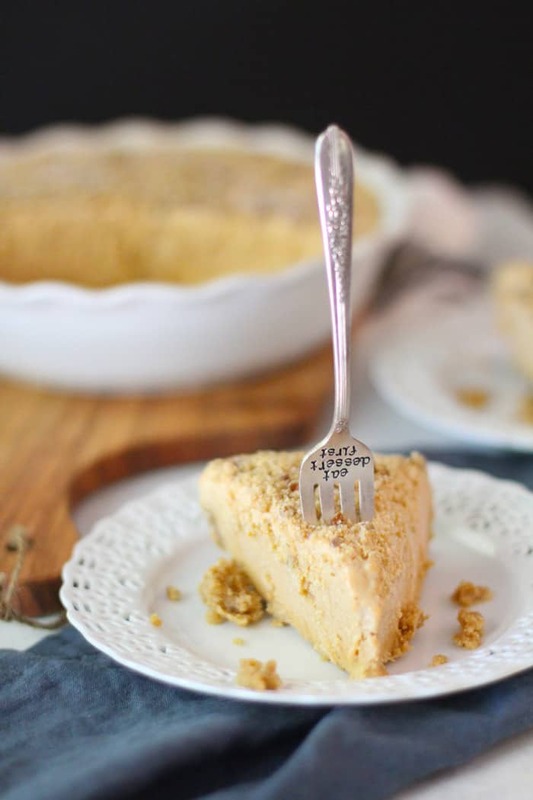 Don’t forget to reserve some graham cracker crumbs for the topping. Spray the pie plate well before pressing the graham cracker crust inside. Let the crust cool completely before adding the ice cream layer. Slightly soften the ice cream in the microwave before blending. 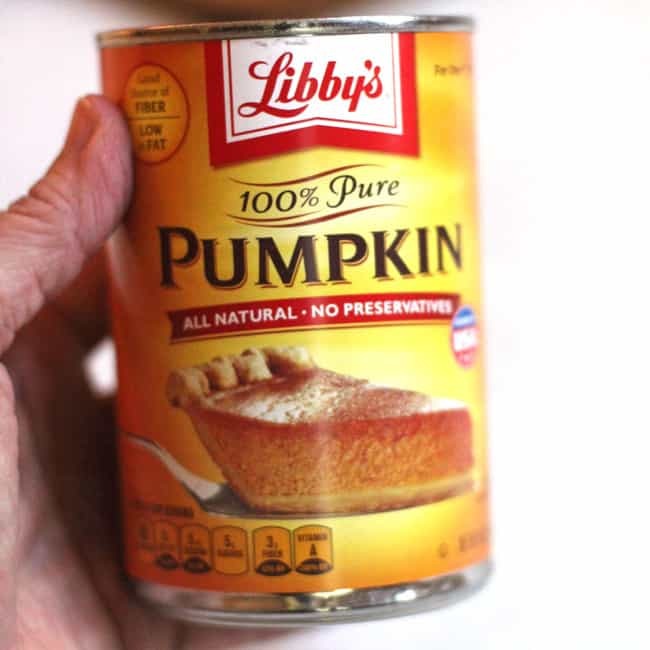 Leftover pumpkin can be stored in a covered container in the refrigerator for up to a week. Storing Tip – cover tightly, and store in the freezer until serving. You can make it well in advance and keep in the freezer. When ready to serve, remove the dessert and let it sit on counter for about 5-10 minutes before slicing. The ice cream lovin’ genes come from both sides of the family. Double whammy. Lord help us. When I was a teenager living in Iowa, my dad and I would literally stand at the kitchen sink with two spoons and a tub of Schwann’s vanilla ice cream (you know, from the ice cream truck). We ate straight from the tub. I think we both agreed that the calories were less when standing with a spoon. No bowl necessary — just a couple of ice cream junkies loving life. And man, would I give anything to be standing with him, over an ice cream tub with two spoons right now. Most likely, we were discussing the current sport I was playing, and he was probably give me “advice”. Strategy, ice cream, father and daughter time. A memory I won’t forget. 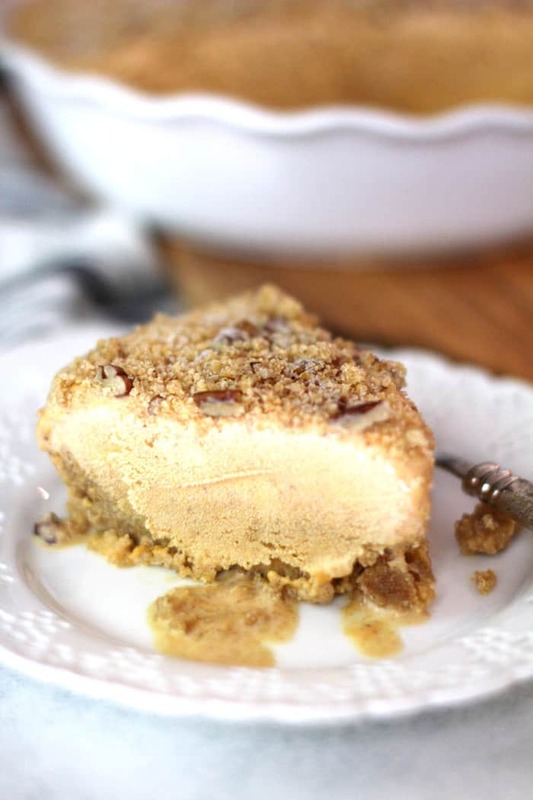 My Pumpkin Ice Cream Pie is an amazing fall dessert, combining ice cream with pumpkin, brown sugar, and fall spices - over a graham cracker crust. Make it ahead of time for less stress during the holidays. Crush the graham crackers in food processor. Add the crumbs and sugar to medium bowl. Melt butter and add to bowl. Stir to combine. Grease a 9-inch pie pan. Reserve 1/4 cup of the crumbs. Add remaining graham crackers and press firmly in pan. Bake on 350 degrees for 10 minutes. Remove to cool. 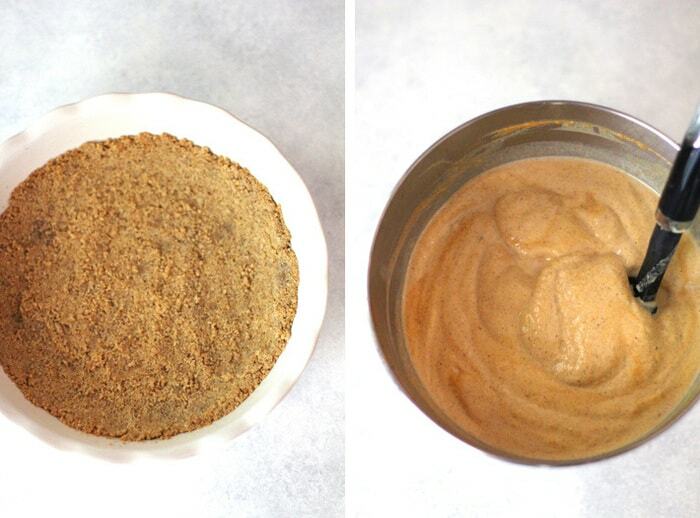 In electric mixer, combine slightly softened ice cream, pumpkin, brown sugar, salt, cinnamon, and pumpkin pie spice. Pour over crust. Top ice cream layer with the remaining graham cracker crumbs and chopped pecans. Cover pie and freeze until serving. 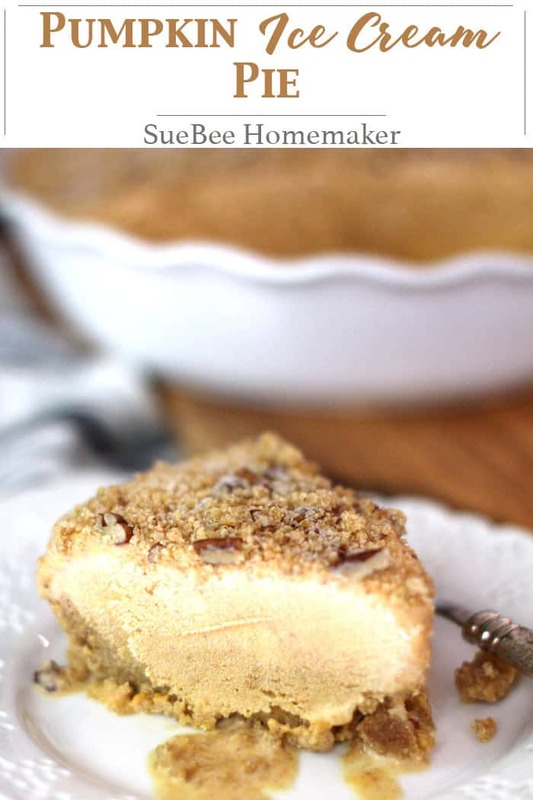 Don't forget to reserve some graham cracker crumbs for the topping. Storing Tip - cover tightly, and store in the freezer until serving. You can make it well in advance and keep in the freezer. Looks delicious! I am making one this weekend. This dessert is timeless. Thanks for the shout out to my Mom. Thanksgiving was my favorite holiday as we celebrated with her in Texas. 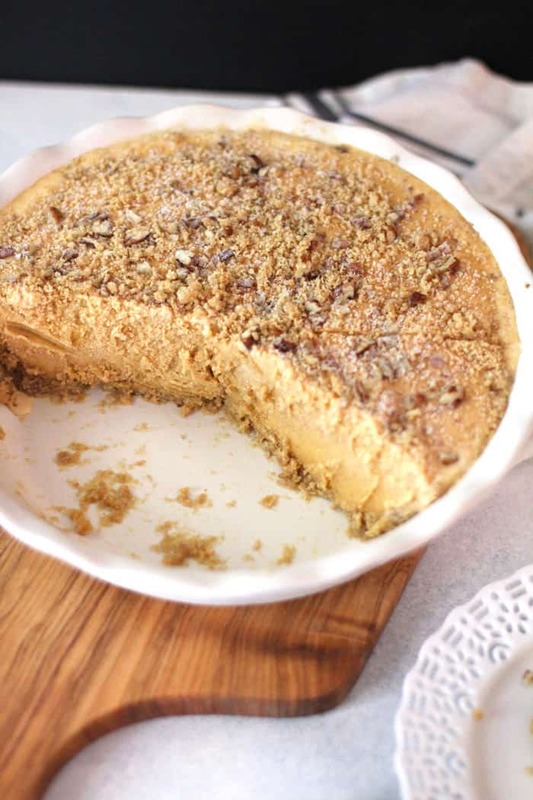 Make this dessert and you will not be disappointed! Love your description of you and Dad around the ice cream container. Jonathan still talks about that with Dad, how he could eat from the container. So can I of course, I am a Reding at heart! !